"Pump and dump" is a form of micro cap stock fraud that involves artificially inflating the price of an owned stock through false and misleading positive statements. So essentially the fraudster(s) buy the stock, say great things about it ("pump" it) or pay someone else to say great things about it, then sell it ("dump" it) at a higher price after gullible people fall for the positive statements and buy the stock. Scarcely traded micro-cap stock prices can be artificially manipulated and inflated simply by vigorously advertising and pitching it to potential investors with truthful information and rosy commentary. Usually these "pumps" arrive in your mailbox as what appears to be perhaps a complimentary copy of a newsletter or one that somehow got mistakenly delivered to you. The "newsletter" may or may not have a price tag printed on the front. The tip off is that the entire newsletter will be devoted to just one stock and it will miraculously have nothing negative to say about the company! Also in some but certainly not all cases, the newsletter mysteriously may not offer any way to pay to become a "subscriber" (not that you would ever want to subscribe)! Normal paid newsletters and magazines are always cluttered with advertisements that attempt to get you to subscribe or buy something... anything! And all of the so-called "newsletters" have tiny small print disclaimers (usually at or near the very end) that essentially state that someone was paid a lot of money to "promote" or "create awareness" about the stock. Sometimes these pump and dumps originate from countries where nobody can or ever will face prosecution. I'm no lawyer but I suspect that even the "pumps" that I discuss on this page may have been published legally simply by virtue of the small print disclaimers that are printed at the end. Of course that isn't any consolation for all of the poor suckers who buy into these unsolicited stock pumps. The SEC needs to impose stricter regulations and the public can't be educated enough about these scams. A common technique used by pumpers to lure investors is to try to ride the coat tails of other (successful) companies. For example, in promoting an oil drilling company they might note that Exxon drills nearby, or find a way to boldly claim that the pumped company might be the next Apple or Coca Cola. Note that in rare cases, companies themselves pay to pump their own stock -- without dumping shares, as was apparently the case with PSON (described near the bottom of this page). This is no cause to let your guard down either. The price gets artificially inflated for a short period of time as grandmas fall for the "newsletter". Soon the smart investors become aware of the pump and react by dumping their shares. Peter Lynch, who ran the highly successful Fidelity Magellan Fund from 1977 to 1990, has said that he was 0 for 25 when investing in companies that had no revenue but a "great story"! And he's not even talking about investing in stocks that are the subject of pump and dump newsletter campaigns! These were just tiny companies in general. So if you are thinking about investing in scarcely traded penny stocks or microcap stocks, that about says it all. You are going to lose money with penny stocks in general, not just pump and dumps. If you're really in love with small companies then do like normal investors do and invest in small cap index funds like VB or SLY. For the last several years I have been tracking every stock that was brought to my attention via an unsolicited "newsletter" that arrived in my mail box. So far every single stock has lost a lot money! Eventually they all seems to eventually lose 99% of their value. It may be a random sampling but I think it speaks perfectly to unsolicited stock recommendations in general. You are going to lose money if you fall for these pumps. DISCLAIMER: These case studies say absolutely nothing about the individual companies themselves unless indicated. Just because a company is the subject of a pump or pump & dump does not reflect on the company itself in any way. In the vast majority of cases the subject companies are not associated with these promotions in any way. And sometimes the publishers were merely paid by yet someone else to write and release the promotional stock report. While it may be regarded as unethical, just because a publisher accepts money to spread awareness about a stock or promote a pump and dump does not mean that they have broken the law. Here's part of an email that I received on March 2, 2010 when Li3 Energy was at 98 cents per share. Whoever was pitching it must have had some sort of special interest in doing so. They had apparently purchased my email address from a list. It's common sense that people don't go to the trouble and expense of sending out mass emails just to be nice and give free advice. 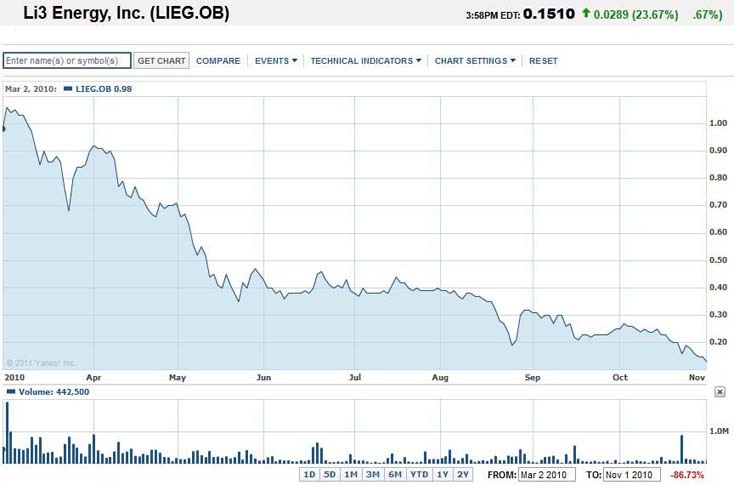 But not surprisingly within less than a year Li3 Energy's shares had declined 86% from 98 cents to 11 cents. By December 21, 2012 it had dropped to 4 1/2 cents for a 95% loss. By July 18, 2013 this stock was valued at 2 cents per share for a 98% loss. Not that you would even consider a stock right after receiving a suspected "pump and dump" newsletter, here was the meat & potatoes of the company's late 2011 report: "The Company incurred an increase in net loss from operations of $392,480 during the fiscal year ended August 31, 2011, compared to a net loss of $74,410 during the fiscal year ended August 31, 2010, primarily as a result of the exploration costs of its Arizona mining claim of $77,649, and the impairment loss related its Arizona mining claim. This represents an increase in loss of $318,070, or 81%. Based upon the capital requirements of the Option Agreement for the Arizona mining claim, the Company expects a substantial increase in its net loss from operations for its fiscal year ending August 31, 2012." The newsletter never mentioned this! Here's a few more that I tracked after receiving my "newsletters" in the mail. EVERY SINGLE one of them dropped in similar fashion shortly after I received the mailers. As disclosed earlier, I don't know if these are or were pump and dumps or just plain pumps, and my study makes no statement about the companies themselves. Either way, the share prices get artificially inflated. When was the last time you received a "newsletter" promoting a fortune 500 company stock? Never! LSTG - Was valued at $0.59 on Jan 3, 2012. John Meyers predicts a six month target of $27.50. Unfortunately exactly one year later this stock had lost 98%. By 9/28/2015 the stock was valued at 0.0025 for a nice 99% loss. SEFE - Was valued at $2.23 on 4/30/2012 but by 9/10/2012 it had dropped to $0.15 for a 93% loss. On 2/22/2013 it had lost 98% to 0.04 per share. By 4/23/2013 this stock was worth 1 cent! The newsletter had headlines like "the next Apple or Coca-Cola" and "Turn $1,000 into $1 Million or More." By 10/9/2013 this stock was worth just $0.005 for a loss of over 99%. OREO (American Liberty Petroleum Corp) - Was valued at $1.24 on 4/13/2012 but by 9/4/2012 it had dropped to $0.05 for a 96% loss. By 2/22/2013 it was worth 0.0311 per share for a 97.5% loss. By 4/18/2013 this stock was worth only $0.012 for a nice 99% loss. The newsletter had headlines like "Urgent Buy Alert" and "By the end of the year, a single share of OREO could be worth more than $15". LOGL - Was valued at $2.39 on 8/15/2011 but by 9/11/2012 it had dropped to $0.10 for a 96% loss. By 2/22/2013 it was worth .05 per share for a 98% loss. The newsletter had headlines like "2,500 shares of LOGL bought today could pay $10,750 profit by the end of the year!" And the letter itself described the author of the newsletter as "among the most respected financial editors being published today." UPDATE: Valued at 4 cents on 3/8/2013 for a loss of over 98%. As of 1/15/2015 the stock was valued at 0.0025 for a nice 99.9% loss. UAPC - Was valued at $1.49 on 3/26/2012 but by 12/10/2012 had dropped to $0.10 for a 93% loss. On 10/25/2013 the stock was worth $0.012 per share for a nice 99% loss! The newsletter had headlines like "Will hit $18.25 a share within four months" and "a once in a lifetime opportunity". POLR - On 6/6/2013 was priced at $5.32 when I received an unsolicited "newsletter" in which POLR was the only stock or investment being solicited. Pump boldly predicted that the stock price would multiply 5 times in 2013. Unfortunately for all of the grandmas who followed the "advice" of this "newsletter", by 12/11/2013 this stock was valued at 5 cents for a 99% loss in about 6 months time! GRZG - On 1/29/2013 was priced at $0.81 - Pump boldly says "A little-known gold stock that could scream 10-times higher in the next 12 months". UPDATE: This stock is down to $0.21 as of 8/2/2013 for a 74% loss. By 12/16/2015 this stock was valued at 1 cent for a nice 99% loss. SLCO - On 11/15/2013 was priced at $1.06. There is a $736,678.23 budget behind this pump which oddly features a black and white photo of its supposed author. Someone is even spreading false Internet rumors of Goldman Sachs upgrading this stock, which was only initially offered 5 days ago, to a "buy". HINT: I have never heard of Goldman Sachs tracking microcap stocks. Never! The "newsletter" boldly predicts a 16 fold share price increase in 8 months. UPDATE: On November 15, 2013 the Securities and Exchange Commission halted trading of SLCO to help protect any grandmas who may have intended to buy into this stock while they investigate this alleged pump & dump mass mailing. The company has stated that they had absolutely no knowledge of this mass mailing. The stock is now trading again, but very scarcely and has hit as low as 19 cents. UPDATE: As of 4/9/2015 these shares are down to 0.001 cents for a nice 99% loss. CNTO - On 2/18/2014 was priced at $2.08. Interestingly this newsletter comes from the same guy who touted Lone Star Gold (see above) which lost 98% of its value in one year. This time he predicts that CNTO's share price will leap to $15.89 within the next few months. Woh Trigger! Stop the presses! The Securities And Exchange Commission already shut down trading on this stock on 2/11/2014 "because of questions regarding the accuracy and adequacy of assertions by Centor, and by others, to investors in press releases and promotional material concerning, among other things, the company’s assets, operations, and financial prospects." According to the small print there is 2.145 million dollars behind this pump. 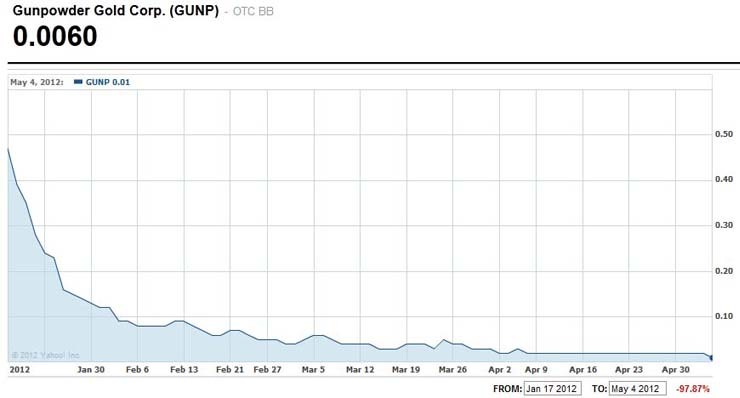 When the SEC allowed trading to resume on 2/25/2014 the bottom dropped out of this stock. Within 3 days it was down to 26.5 cents for an 87% loss! Within 9 trading days it was down to 11 cents! On 4/29/2014 it was down to 5 cents for a nice 99% loss. AHII - On 3/20/2014 was priced at $1.60. Someone spent $1,643,756 to pump this microcap stock up. The author of this "newsletter" calls this stock an "immediate buy" and suggests that this stock "could" double or triple. He amusingly touts other stocks that have climbed between 550% and 4,900% then contradicts himself by saying that he is "not suggesting that American Heritage international stock will climb 4,900%" in five days". Why mention this 4,900% stock in the first place??? I expect this stock to plummet as soon as the dumpers are able to unload their shares. Within 3 trading days it was down to 70 cents for a 56% loss. Since then trading has evaporated. No wonder the scammers picked these scarcely traded shares! Anyone who fell for this pump and dump is now wondering what hit them. UPDATE: I just received a second copy of this "newsletter" on 4/19/2014. Evidently the dumpers still have more stock to unload on gullible grandmas. As of 4/9/2015 the stock was down to 2 cents for a nice 99% loss. 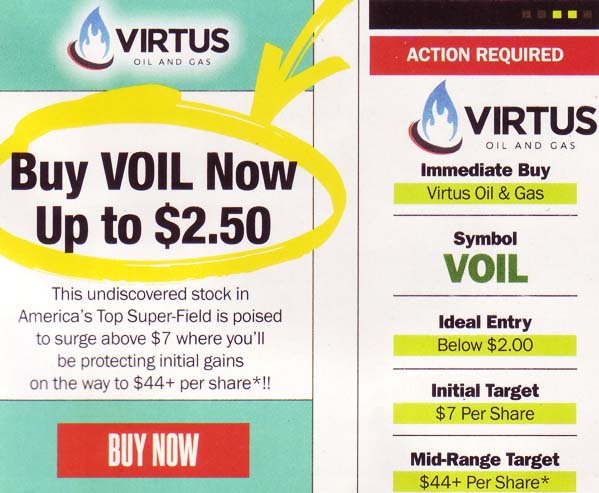 VOIL - On 9/22/2014 Virtus Oil and Gas was valued at $1.80. This "report" is actually a paid advertisement. The publisher was paid $5,000 for his "contributions" to this advertisement. The company itself is warning investors about this newsletter. This advertisement claims "our timing could not be better"! How funny! They are predicting the share price might rise to $7.00 (presumably within the next year?) and then it's off to $44.00 per share! I hate to burst their bubble but I am predicting that the share price will easily drop to 10 cents within the next year. 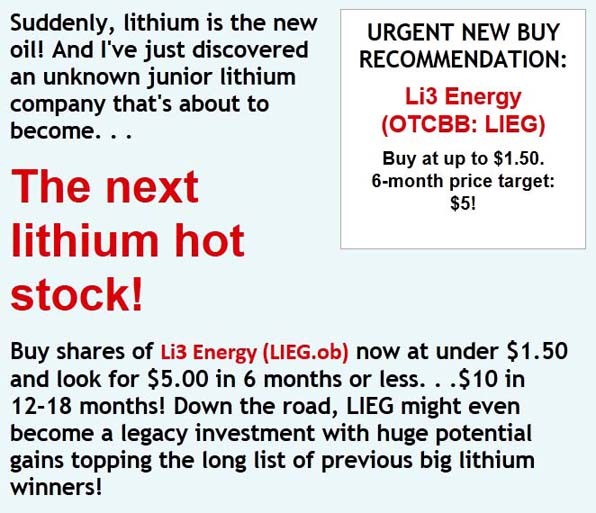 UPDATE: I received yet another one of these "newsletters" on 10/14/2014 when price was at $1.39. That explains why it's taken so long for this stock to collapse. As of 1/5/2016 this stock was down to $0.017 for a nice 99.9% loss. TQLA - On 7/20/2013 was priced at $0.7410. Pump boldly predicts that this tequila stock could go up 14 fold this year! Anyone who believes it based on the "newsletter" is probably drunk on tequila. On 8/29/2013 these shares were down to 25 cents. 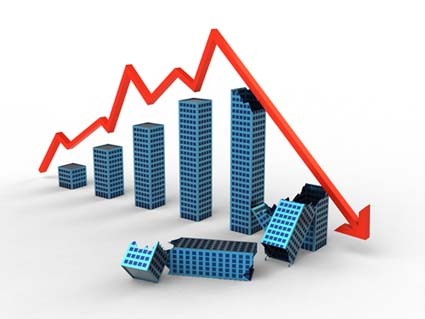 UPDATE: As of 6/1/2015 TQLA investors have been left in a drunken stupor. The stock has hit a new low of 0.008 cents for a nice 97.8% loss. 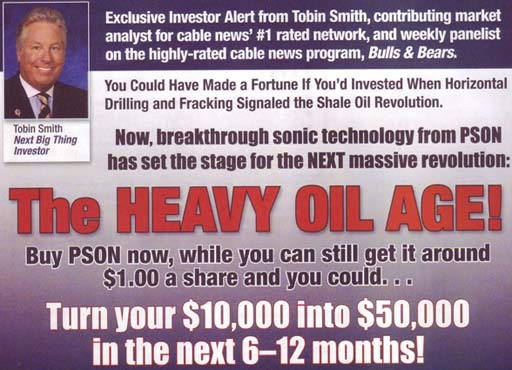 PSON - On 4/3/2013 was priced at $0.84 - The pump newsletter boldly says "Look for 5-bagger in the next 6 - 12 months!" 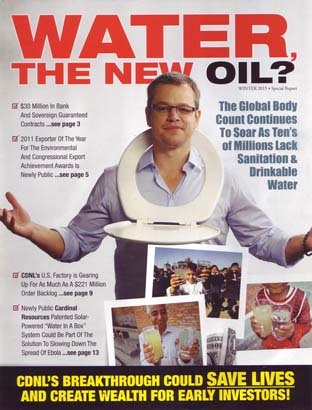 I was shocked to see that a cable news analyst's name was attached to this pump "newsletter" (although I had never heard of this guy before). UPDATE: A month later I received a second pump newsletter for this stock. Well that explains why this stock has taken so long to fall. UPDATE: 6/19/2013 - A full 2 1/2 months later the media has finally caught on to this story and reported that the Fox New analyst was reportedly paid $50,000 to pump this stock by the company itself PSON! What more do you need to know? Stock is back down to 83 cents. Look for this stock to test to 50 cent barrier very soon. The analyst was reportedly fired. Market Watch noted that the analyst completely ignored the glaringly negative points about PSON such as its rising losses, negative cash flow and the fact that auditors believe that Petrosonic could go bankrupt if it can’t continue to raise cash/financing. He never mentioned any of this in his “special report.” It is apparently perfectly legal to "promote" a stock in this manner. But I think we can all agree that a bought-and-paid-for stock endorsement is definitely no cause for someone to invest in a stock! It initially and temporarily artificially inflates the price of a stock. UPDATE: Down to $0.01 as of 1/14/2016 for a nice 99% loss. It's becoming apparent that this stock won't be the 5 bagger that this former Fox News analyst asserted. CONCLUSION: Never buy stocks based on unsolicited newsletters, emails, etc. History has shown me that more often than not, when pumped, these stocks will lose at least 97% of their value! By the way I did not cherry pick newsletters. As soon as I receive one I post a notice here. ALL of the newsletters I have received have led to these stocks plummeting. Not one diamond in the rough! WTER - On 10/12/2013 was priced at $0.64 - This massive 3 million dollar pump is trying to ride the coattails of "famous celebrities and celebrity athletes" who don't specifically drink WTER products, but drink healthy water in general or drink successful beverages like Vitamin Water and Arizona Ice Tea. 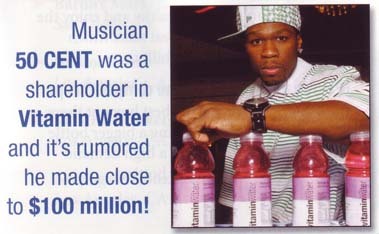 50 Cent made millions off of Vitamin Water; So can you with WTER. LOL. These other brands were successful so why can't WTER be successful? How many times have we seen this coattail riding movie?! The promoters boldly claim a 6 month target of $4.00 to $6.00 per share. UPDATE: Received a second "newsletter" on 11/25/2013. UPDATE: One gallon Bottles of Vitamin water have actually appeared on the shelves of a local Los Angeles supermarket that I visit. I can report that they aren't exactly flying off the shelves. We'll see if they reorder more or if this is a one and done product. Good luck trying to knock off Arrowhead, Sparklets, Crystal Geyser and the generic grocery chain brand, as if we don't already have enough water choices. As of 12/9/2014 this stock down to 6.4 cents. As of 12/8/2015 the stock was down to 0.039 cents for a nice 94% loss. KRED - On 2/10/2014 was priced at $0.97. According to the mailer there is 2.3 million dollars behind this pump. The small print even explicitly states that "entities related to" the company that are spending 2.3 million dollars "hold a large amount of shares in KRED and intend to sell those shares. Their sale of KRED common stock will affect the value of your shares (negatively)". Well then why is the publisher of this "newsletter" touting this stock??? The publisher even has the nerve to offer a book about avoiding pump and dumps! So this "newsletter" completely contradicts itself! Stock was down to 49.50 cents as of 4/7/2014. Stock was down to 5.1 cents as of 11/16/2015 for a nice 95% loss. 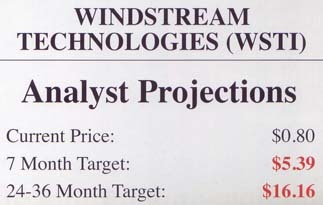 WSTI - On 7/14/2014 Windstream Technologies stock was priced at $0.835. "Newsletter" predicts $5.39 by Feb 14, 2015 and $16.16 by 2016 to 2017. LOL! If you have a magnifying glass you can read the "newsletter" micro small print disclaimer which says "do not base any investment decision upon any materials found in this report". Well then what's the point of this $900,000 mailer??? LOL! Just to clutter up people's mailboxes? I predict that this stock will gradually collapse to near zero by mid 2015. If the SEC halts trading then I expect it to plummet even sooner. Was down to 0.0001 cents as of 1/8/2016 for a nice 99.99% loss. CDNL - On 1/14/2015 Cardinal Resources was priced at $0.55. Pump newsletter boldly states that CNDL could "turn $5,000 into $92,000 rapidly". How? What's their grand plan? By doing business with impoverished third world African countries that can't afford to pave roads and they build homes out of things like palm leaves and junk car parts. LOL! Evidently the shareholders who own this stock have finally decided that they want out of this stock. The fine print, which literally requires a magnifying glass, says that shareholders poured $670,000 into this pump and that they fully intend to sell their shares. Translation: THIS IS A PUMP & DUMP!!! The fine print also states that the publication does not include the all important analysis of the company's financial position. LOL Why not??? Probably because the company is in debt to the tune of 1.246 million dollars! I predict that your $5,000 will be worth $100 within 1 to 2 years. As of 10/07/2015 shares of CDNL were already down to 0.0048 cents for a nice 99% loss.